Benjamin Percy and the Green Arrow creative team -- particularly artist Juan Ferreyra -- continue to produce a book that's a model for what every DC Comics series should be. Despite stories that may begin to seem familiar to fans of recent Green Arrow runs, Percy and team's work remains engaging and most of all visually mature, with clear craftsmanship that other teams just can't achieve. Percy only has two Rebirth Green Arrow volumes left, and at the twenty-five-issue mark, Green Arrow Vol. 4: The Rise of Star City feels distinctly like the end of the beginning, leading to the beginning of the end. Star City collects eight issues, being a three-part, four-part, and one-off stories. In this way, it's a nicely long book that doesn't feel too long because there's plenty variety of focus. An abundance of two-page spreads speeds things up too, but Star City is a prime example of what a creative team can get away with when they're good, because Ferreyra and company's spreads are so well-rendered, so narrative, and colored so distinctly as to feel essential to the storytelling. 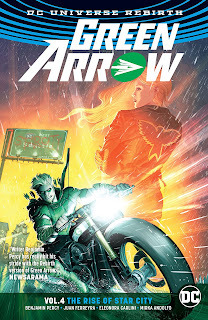 From the un-bordered word balloons on out, Green Arrow is a book that always looks great -- when, far from DC Comics's front line, it doesn't necessarily need to -- and what a world it would be if this were the rule and not the exception. Percy's first story ducks the book's present action for a moment to see Green Arrow Oliver Queen reuniting with Arsenal nee Speedy Roy Harper; the second story picks up with Oliver's fight against the Ninth Circle in Seattle, followed by an epilogue. Percy weaves somewhat uncertainly in and out of (semi-)established Green Arrow continuity, in that this book still started off from the death of a New 52 character, Wendy, and Oliver's New 52 costume makes an appearance, but Percy nullifies or otherwise retells certain aspects of the New 52 lore, seemingly including Robert Queen's survival (though he still appears to be father to Red Arrow Emiko) and Oliver having saved Shado from foreign dictator Count Vertigo. We've also been through a fairly similar origin of Roy Harper over in Red Hood and the Outlaws, not to mention that Oliver has been fighting the Ninth Circle on and off for twenty-five issues now, such that in its broad strokes Star City is not all that groundbreaking. Starting with the book's pipeline protest story and finishing with the final villain's capitalism run amok, Star City is among the most metaphorically political of Percy's volumes, not that there's anything wrong with that. Black Canary remains the book's sticky wicket, here supposed to represent the full liberalism that Oliver can't embrace, by encouraging him not to try to retake control of Queen Industries (pawn of the evil city government) because the people voted the government into power, misled or not. Canary comes off naive here, arguing a wild counterpoint to Oliver's clearly correct plan simply, it seems, because Percy's story needs her to (and then acting uncharacteristically jealous later on). I do feel this title is where Canary should be, but her depiction here is much in line with how she has not really worked in this run. Benjamin Percy's extra-sized finale to Green Arrow Vol. 4: The Rise of Star City is fun not only for Otto Schmidt's contribution, but also because Percy teases some storylines to come. We know, of course, that the next book will be a whirlwind tour of the DC Universe, reestablishing this Rebirth Green Arrow's relationships with some of his past-continuity friends, but I thought it was a nice touch that Percy also nods to the upcoming Dark Nights: Metal tie-in. Percy's suggestion that one of the Star City ancients might've forged an early arrow from that "metal" is a lagniappe for continuity wonks, and I hope that gets more specific exploration when Metal itself comes to town. Again, this is a fine and fine-looking book, and I'm glad my copy of the fifth volume arrives any second now.